I was recounting a personal story in my facebook Chef In You page just couple of days ago, about how the usage of local and seasonal fresh produce is palate changing. This particularly was evident to me the minute I tasted strawberries. Growing up in India, strawberries came in a ridiculously expensive box that when you closed your eyes (and conscious ) enough to buy one, tasted so sour and blah making you question your sanity. So, I always wondered what the hype in western books were about silly strawberries. When I came here (where strawberries are certainly not imported! ), the taste was quite different that shocked me. 1. Sugar: You can use any kind of sweetener you like. I have tried it with Maple syrup, Agave and Honey. 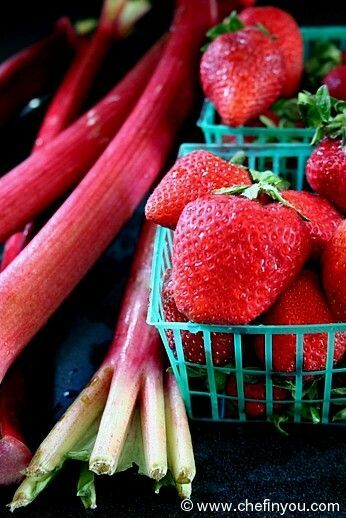 Each has its own unique taste and brings its own flavor to the table in combination with Rhubarb and Strawberries. The amount of sweetener will depend largely on the sweetness of the strawberries and your taste preference. We do not like very sweet things hence mine always tends to border on light sweetness. My strawberries were extremely sweet hence I could afford to reduce the sweetener. I used around 1/4 cup honey and 3 tbsp regular white sugar for this particular recipe. I personally find the flavor of honey little overpowering and hence use it in combination to regular sugar thereby reducing refined sugar to a large extend. But use your palate to decide the kind and amount of sweetener. 1. 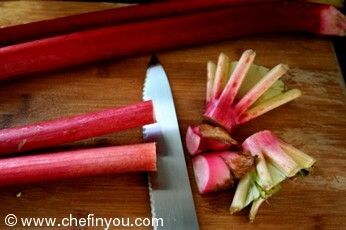 Trim the edges of Rhubarb. If you have green leafy stalks, make sure to especially discard the leaves. 3. 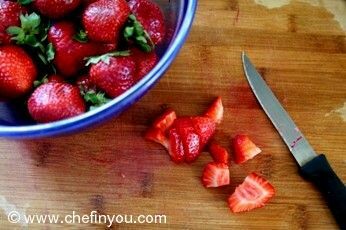 Wash, hull and Chop the strawberries into quarters. 4. Combine them in a large saucepan and add the sweetener of you choice. 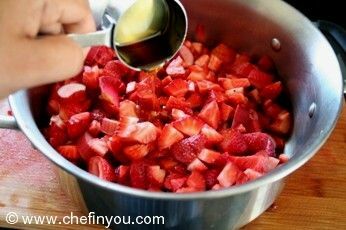 I used 1/4 cup honey and 3 tbsp sugar depending on our taste and sweetness of strawberries. 5. Place the pan over medium heat for 5-8 min. 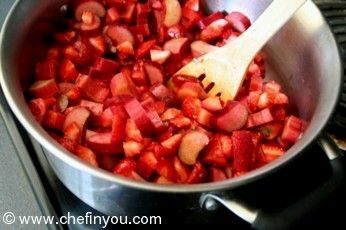 7. until rhubarb becomes a sauce, stirring occasionally. We enjoyed it on waffles and pancakes. 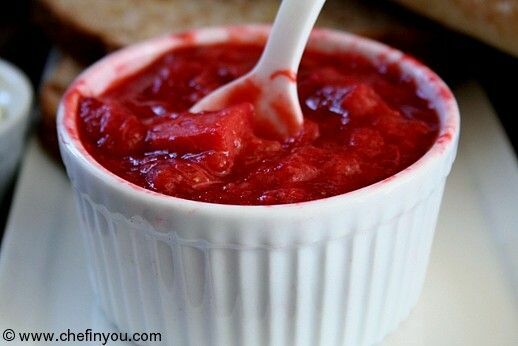 My husband and I just made this wonderful recipe with 4 cups of rhubarb, 4 cups of strawberries and 1 cup sugar and, to our taste, it was just perfect...not too sweet...thank you for sharing...awesome! Us Germans also use it along side pork chops and on oatmeal. You can also add either a can of diced pineapple or fresh pineapple to this, gives it an even better flavor. We grew rhubarb in our garden in Illinois. This recipe is wonderful eaten cold from the refrigerator as an applesauce dessert - only yummier! 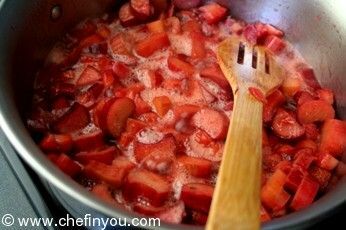 I have made strawberry rhubarb before but never used honey only sugar. I have to say honey makes it taste so much better. I will never use sugar again. Thank you! Nothing beats the taste of strawberries from the farmers market. 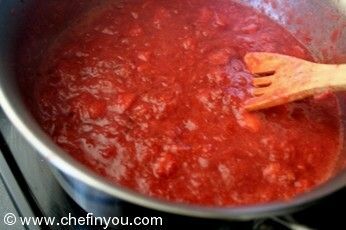 This is a wonderful sauce, love the combination! 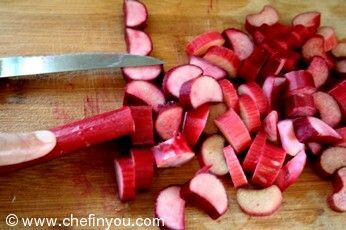 Am yet to try rhubarb,looks marvellous,irresistible and yummy.. 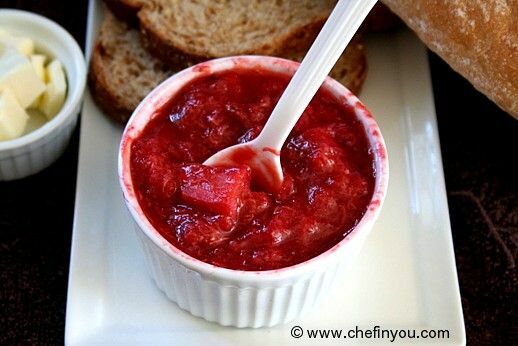 I enjoy Rhubarb and have some planted at my mothers (moving them to my house in the fall) This recipe looks very tasty, and would prob hold up well if bottled?